Bing Ads enables Marketers to track and monitor campaigns, clicks, CTRs, spend and budget. Bing Ads lets you place cross-device product ads in front of Bing, Yahoo, and MSN customers and support imported pay-per-click ad campaigns from third-party platforms like Google AdWords. With Bing Ads you can also retarget ads to customers after they complete an action like leaving a shopping cart or viewing a product without purchasing. Learn more about all you can do with Bing Ads here. You can also browse the code on GitHub. This document was last updated on January 29, 2018. If you notice any gaps, outdated information or simply want to leave some feedback to help us improve our documentation, please let us know! The first step is to make sure Bing Ads supports the source type and connection mode you’ve chosen to implement. You can learn more about what dictates the connection modes we support here. Before you can track conversions or target audiences, you need to create a UET tag in Bing Ads and then add it to the destination settings. Follow the steps within the Bing Ads documentation to create a UET tag. In about 5-10 minutes the CDN will be updated and Bing Ads’ snippet will be initialized onto your page. Note: You’ll only be able to include one Tag ID per source so make sure to associate the conversion goals to the correct Tag ID that is included in your settings. Page events will be sent to Bing Ads as a Page Load event where name and properties are optional. 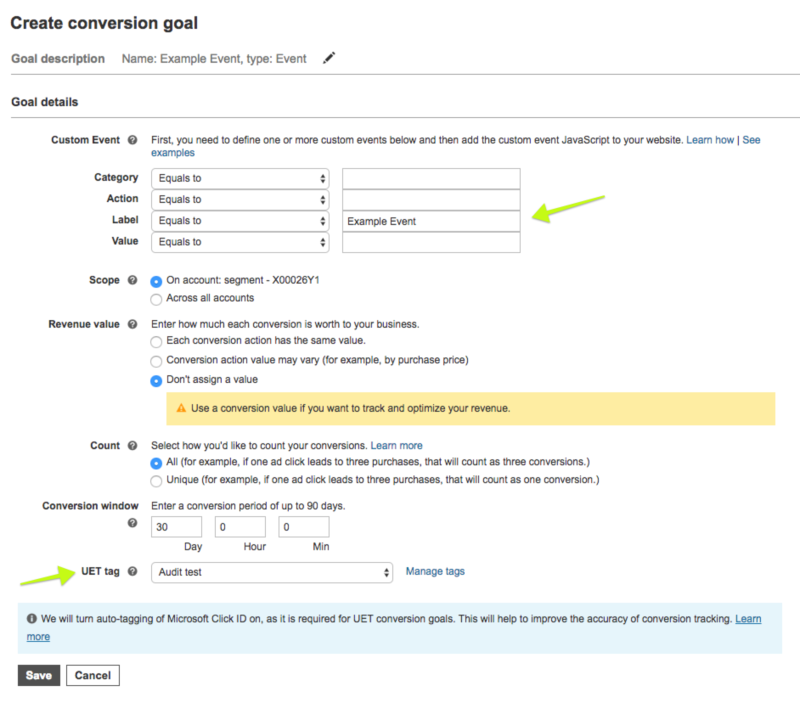 Choose the Event type of conversion and click Next. Fill in the appropriate values. Make sure to add the Segment event name as the label field and to associate the goal to the correct Tag (UET Tag) that is set up in your Segment source.